A Call to Prayer of One Accord, There is a son out there in the world By the name of Joshua who is off the edge. I have been asked to pray for him, and I am asking all who read this to do the same. In this prayer we are asking God to use His perfect judgement and love to do whatever it takes to bring this lost lamb back Home in His arms. To me this is the most important prayer a man can make, for is it not written that Jesus said I AM The Good Shepherd? Is it not written that the Shepherd left the ninety and nine to find the one that is lost? On October 15, I got a request to pray for Joshua and I sent an email back asking if I could blog this prayer request. Today I heard back. Join with the Men of One Accord in prayer for the one that is off the edge. I have heard and watch the prayers of a child and the faith in which he freely asks anything of Jesus. I have watched and witnessed Jesus quickly answer and give far more to that child than what he asked for. Yes I know I have taken this verse out of context, but as for my grandson he knew nothing about context, He just wanted to ask Jesus for something special that day. 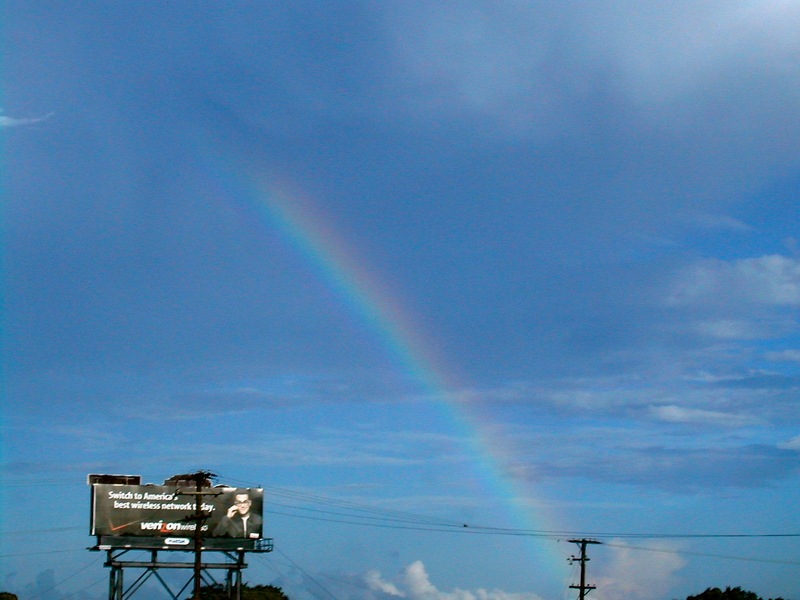 His father was so amazed by the sight of the rainbow he stopped and took the above picture. I love the Verizon bill-broad that just happens be in the picture.